One evening last year, a couple were driving past Strathbogie church where one of the Nosh leaders, Di Mackrell was holding a session of the Strathbogie singers. Seeing a significant number of parked cars along the roadside, the couple pulled up to find out what was going on and were invited in by one of the choir members, whom they happened to know. In the funny fateful way life sometimes has, this pique of curiosity brought them straight into a setting where one of them would later find unexpected closure. Having been told by a teacher to “mime not sing” at the age of just five, this woman’s confidence in her ability had remained squashed flat for her entire life. Once they stepped into the Strathbogies’ session, it wasn’t long before Di had them joining in with the singing. Like most singing leaders, Di encounters singers who have lost confidence because of cruel or thoughtless comments made in the past ‘all the time’. Being able to turn this around is heart-warming for everyone. Di Mackrell is a little bit biased about the transformative power of Euroa Vocal Nosh with good reason and actually, this is where the story starts. At the final 2017 session of Euroa Vocal Nosh, there were 26 singers in the room which prompted Di to celebrate and reflect on the magic of this phenomenon which has been a regular fixture on the community music calendar there, for sixteen years. The group was established in 2001, but Di didn’t take a central role until one of the original leaders had to move away and a second leader felt it was too much continue running alone. Di attributes the ongoing appeal of Vocal Nosh to the philosophy, ‘if it doesn’t work it doesn’t matter’. It’s a free and fearless space and people can carry this positive attitude out of the door to transfer into other aspects of their lives. Di shares the load of running the Nosh with two other leaders, Chris Day and Margie Chowanetz. The group runs on the goodwill of the three women and their shared passion for inspiring others to discover and share their love of singing. Each singer pays $15 which covers the cost of a generous caterer and the local venue. To make it more sustainable for themselves they have reduced pressure on their time by cutting the number of sessions held each year from nine to five, meeting every second month from March to November. New people pop in all the time and there’s only been one session Di can recall when there hasn’t been a fresh face in the room. It doesn’t matter if you miss a session, three, four or even more. Everyone can be guaranteed of a heartfelt greeting upon their return, no matter how long the period of their absence. Di finds it ‘magic’ to take a roomful of people who have never sung together before and within ten minutes, have all these beautiful harmonies and connections happening. Di Mackrell, Margie Chowanetz, Nosh guest Jane Coker, and Chris Day. The cake was to celebrate the tenth anniversary of Euroa Vocal Nosh. To join Euroa Vocal Nosh, or to find a singing group near you, click here. Written by Deb Carveth, online editor for Community Music Victoria in collaboration with Di Mackrell. Figure 1: The Nogat Singers, Berlin (Neukölln). Photo (c) The Nogat Singers, 2014. I arrived at Rathaus Tiergarten, a local town hall of Berlin on a sunny spring afternoon in May, just in time for a celebration. Assorted stalls, abuzz with colour and activity, promoted organisations that support people with disabilities and their carers. On the town hall steps a rock band called Handiclapped was setting up shop as a carload of nervous and excited singers arrived. They were members of the Nogat-Singers (Figure 1), a neighbourhood choir from the Neukölln suburb of Berlin who were star performers for an event to promote, celebrate and advocate for the rights of people with disabilities. Their performance was a vibrant and colourful mix of popular German folk songs and Schlager (there is no equivalent to the Schlager phenomenon in the English speaking world, but think Eurovision or Germany’s answer to American country and western music!). Having joined their dress rehearsal earlier in the week, I was impressed by the choir’s energy and its commitment to fostering a sense of community. Founded by disability support organisation Lebenshilfe Berlin, the Nogat-Singers rehearses weekly in a local supported accommodation service, and most members live with intellectual disabilities. The choir receives funding from a social inclusion project grant of the European Union for its close neighbourhood ties. This made sense to me – a choir that sings with neighbours in its little patch of Berlin while at the same time fostering social inclusion for people with disabilities. Here was a great example of community music-making in action (or musicking as Christopher Small (1998) describes) and an ideal starting point for my study of choral singing in Germany. The Nogat Singers is just one of a vast number of choirs singing regularly across Germany. They range from church choirs, to community choirs (defined loosely as amateur or non-professional choirs that perform publically) who perform in local pubs or municipal halls, through to professional choirs employing full-time salaried singers (there are eight at last count, from smaller chamber choirs to large radio choirs). My time in Germany in 2014 as a fellow of the Australian German Association and the Goethe-Institut allowed me to visit many and to explore the rich practice of choral singing in Germany today. Inspired, I returned with ideas for our choral movement in Australia. In this article I set out just a few impressions from my trip. Support for the Arts and amateur music making in Germany has a long history. I once heard a passing comment about the three historic features of German village life: a shooting club (Schützenverein) for community defence; a fire brigade (Feuerwehr) for community safety; and a choir (Gesangverein or Liedertafel) or brass band (Kapelle) for community wellbeing! In 1871, 38 territories and free cities united under a common German federation. Most brought with them their own opera houses, concert halls and musical ensembles that had serviced the historic royal courts. Churches too played a crucial role in preserving musical traditions; in smaller communities church musicians were often school music teachers and community choir leaders too. One contemporary example of this long-held tradition is the St Thomas Boys Choir (Thomanerchor Leipzig) – perhaps the most famous boys’ choir worldwide – that celebrated its 800th anniversary in 2012 (Wydra, 2015). Germany’s historical experiences with music – both negative and positive – have shaped its contemporary community singing culture. The atrocities committed by Germans during the period of National-Socialist (Nazi) government from 1933 to 1945 overshadow German attitudes toward music, singing and cultural practices. The Nazi government’s approach to music education, known as Musische Erziehung, manipulated music to suit its own agenda (Kertz-Welzel, 2008; 2013). This period defines to this day the parameters of “acceptable” music making. As Germans distanced themselves from the Nazi period after 1945, therapeutic uses of music were restricted to clinical settings rather than practiced out in the community. This was particularly the case in former West Germany and came at the expense of practices and initiatives that supported community wellbeing. Key scholars at the time supported this position. Theodor Adorno, in a series of speeches and public discussions between 1959-69, argued that after the manipulation of the Nazi period, music could not and should never be used to pursue goals of healing or social transformation (Kertz-Welzel, 2005). Adorno argued instead for the pursuit of musical excellence and individuality and against collective, community-minded music by amateur music-makers with transformative goals. Rather than teaching and enjoying singing with explicit goals such as community wellbeing in mind, music in West Germany was increasingly seen as an activity for its elite musicians, professionals, and with learning focussed on musical excellence. In the former East Germany, community singing was more widespread with its community wellbeing benefits recognised, but it frequently also served a propaganda purpose for that government. Opinions across reunified Germany in recent decades have shifted. Music education scholars are once again discussing the place of community music and the potential extra-musical benefits of music in schools, including for community wellbeing (Kertz-Welzel, 2008; 2013). Yet the emphasis on the aesthetics of music across post-war Germany (East and West) preserved and nurtured a vital and historic cultural asset. Culture and the creative arts remain highly valued and comparatively well funded within German society and by all levels of government (McCaughey, 2005). A 2007 federal government report reinforces this view, arguing: “Culture is not simply ornamental; it is the foundation of our society and the platform upon which it grows. The role of politics is to safeguard and strengthen culture[i]” (Deutscher Bundestag). A total of EUR11.2 billion was spent in 2011 to support Germany’s cultural activities, including EUR8 billion from its federal, state and municipal governments, with the remainder from its Christian churches[ii] and private funding. Germany’s 16 States (Länder) together contributed more than one third of this total (EUR3.4 billion). The Länder retain powers in educational and cultural matters and a large say in preserving Germany’s many cultural identities. Musical life in Germany today is “noted for its diversity, high quality and geographic density – keywords that continue as ever to define Germany‘s special reputation as a land of music” (German Music Information Centre, 2011, p. ix). There were at last count 133 publicly funded symphony and chamber orchestras, 83 music theatres, nearly 500 regular music festivals, and thousands of amateur, semi-professional choruses, orchestras and ensembles (GMIC, 2011, ix). It is not surprising then that community music making is the largest civic movement within Germany (Reimers, 2012, p.1). Choral singing today is an opportunity for many to partake in some of the musical delights and masterpieces of Germany’s rich choral music history. A leading scholar of German choral singing (Brusniak, 2003, p.69) suggests choral music and a vast and diverse tapestry of choirs are essential and integrated parts of its public and private musical life. There are nearly 59,100 associated choirs and choral organisations in Germany, including about 29,900 secular and 37,200 religious organisations. These choirs engage nearly 2.3 million singers regularly (Reimers, 2012, p.2). There is a large audience base for choral concerts too. A 2004 study estimated about 60 million people attend some 300,000 choral concerts annually in Germany (reported in Reimers, 2012, p.1). These formal choral activities do not include the multitude of established and ad hoc choral groups and public singing that is an increasing feature at large gatherings – the 2014 World Cup football tournament comes to mind! I was interested to find out who spoke for choral music in Germany. At first sight, the coordination and advocacy of choral music across Germany evoked images of Franz Kafka’s writings: a confusing landscape of overlapping organisations, funding bodies and responsibilities all claiming to represent and advocate for the interests of choral music. Yet when viewed through Germany’s unique historical lens this overlap, it seems to me, provides safety in plurality (Vielfältigkeit). It avoids a single, central point of control for a mass movement and all the negative consequences this represents in many German minds. Germany therefore sings with two voices when it comes to choral singing. Two peak bodies represent choral singing nationally: the Bundesvereinigung Deutscher Chorverbänder e.V. (BDC) and the Deutscher Chorverband e.V. (DCV). Together they include and advocate for the vast majority of German choirs. The DCV is the world’s largest choral association and represents the vast majority of Germany’s non-religious choral associations (including over 30 state-based and regional associations). DCV designs and oversees a host of innovative programs and schemes for its member choirs and leaders, supported by a paid, full-time staff. It also publishes Chorzeit, Germany’s monthly national choral music magazine with 35,000 subscribers and on sale in newsagents across the country (DCV, 2014). The BDC counts among its members Germany’s peak catholic (katholische) and protestant (evangelische) choral organisations, those representing youth music, and its 500 concert choirs. The Federal President of Germany bestows the Zelter Plakatte to choirs that reach 100 years of age – an important initiative administered by the BDC (2014). In 2014, Germany’s choral music culture is in transition. When I talked about my research project to non-choral music enthusiasts (or better said, yet-to-be converted choral music enthusiasts), many pictured the all-male Liedertafel choir, Germany’s dominant historical choir model. Yet this traditional picture of “choir” is rapidly changing. A 2012 New Zealand film/TV documentary about folk singing in Germany, Sound of Heimat – Deutschland Singt (http://www.soundofheimat.de/), helped to raise awareness about the diverse types of music out there. The sheer variety of musical styles and the ability of singers to seek out choirs according to their musical tastes and less limited by their location have fundamentally changed Germany’s choral community. Children’s, youth and women’s choirs are growing while the more traditional choral organisations (such as the Liedertafel) are in decline. Mixed choirs have grown in popularity and now outnumber male choirs (Arit, 2014) and there has been a boom in jazz and pop genre choirs (AlumniPortal Deutschland 2014; Tip Magazin, 2014). Singing-related talent competitions, television series and films, as popular in Germany as in Australia, have contributed to this popularity. Figure 2: Die Rheintöchter, lesbian comedy choir, Cologne. Photo (c) Magdalena Hutter, 2013. I took particular interest in community choirs with members who may have experienced social exclusion at some point in their lives. I observed many choirs of the Lesbian, Gay, Bisexual, Transgender and Intersex and Queer (LGBTIQ) communities (Figure 2 for example), choirs for people with disabilities, church-based choirs supporting new migrants to Germany and choirs for people experiencing homelessness. I led a rehearsal of Hard Chor ELLA (Figure 3), an innovative school-based community choir based in Pankow, a suburb of the former East Berlin. I was also fortunate to observe Berlin’s two professional choirs in rehearsal (RIAS Kammerchor and Rundfunkchor Berlin) and the Rundfunkchor in performance. You can find a full list of choirs, interviews and more detailed case studies in my report. Figure 3: Hard Chor ELLA, Berlin (Pankow). Spring Concert. Photo (c) Inés Weinmann, 2013. Establish a national professional choir that includes within its mandate significant outreach work to choirs and communities of all ages. To achieve these things we would need to first properly resource our expert national organisations already doing such great work in the area – the Australian National Choral Association (ANCA) and Music Australia – along with state-based institutions such as Community Music Victoria. Let’s start this conversation and draw upon lessons and ideas from countries such as Germany to give us a head start. Choral music in Germany, a celebrated and treasured cultural asset, is gradually changing its tune to include people of all abilities and backgrounds and in a way that improves community wellbeing and cohesion. My time there provided refreshing ideas, valuable lessons and ongoing inspiration for my practice as a choral leader and researcher in Australia. Above all, it was a reminder to celebrate both the act and the art of choral music making and the joy it brings to communities here and in Germany. (1): My thanks to Dr Alex Crooke for his insightful comments on earlier drafts of this paper. Ben Leske is a Melbourne-based choral conductor, community music facilitator, and PhD candidate in the National Music Therapy Research Unit in the Melbourne Conservatorium of Music (The University of Melbourne). Ben’s thesis explores choral singing and social inclusion for young people. From 2009-2014, Ben was Music Director of the Melbourne Gay and Lesbian Youth Chorus (now shOUT Youth Chorus). Ben is passionate about all things German and was awarded the Australian German Association and Goethe-Institut Fellowship to explore choral singing in Germany in 2014. You can read Ben’s full report at: http://www.aga.org.au/fellowship/past-winners/. Arit, Alexander. (2014, 1 July). Graphical statistical reference of number of choirs by type (historical) – 1951-2005. Unpublished data provided to author. Brusniak, Friedhelm. (Ed.). (2003). Chor – Visionen in Musik. Essener Thesen zum Chorsingen im 21. Jahrhundert..Arbeitsgemeinschaft Deutscher Chorverbänder. Deutscher Bundestag. (2007). Schlussbericht der Enquete-Kommission: „Kultur in Deutschland“. (16/7000), author’s translation. German Music Information Centre (GMIC). (2011). Musical Life in Germany: Structure, Facts and Figures: German Music Council (Deutscher Musikrat). Kertz-Welzel, Alexandra. (2005). The pied piper of Hamelin: Adorno on music education. Research studies in music education (25), 1-12. Kertz-Welzel, Alexandra. (2008). A matter of comparative music education? Community music in Germany. International Journal of Community Music, 1(3), 401-409. Masso, Alex. (2013). Community Choirs in Australia. 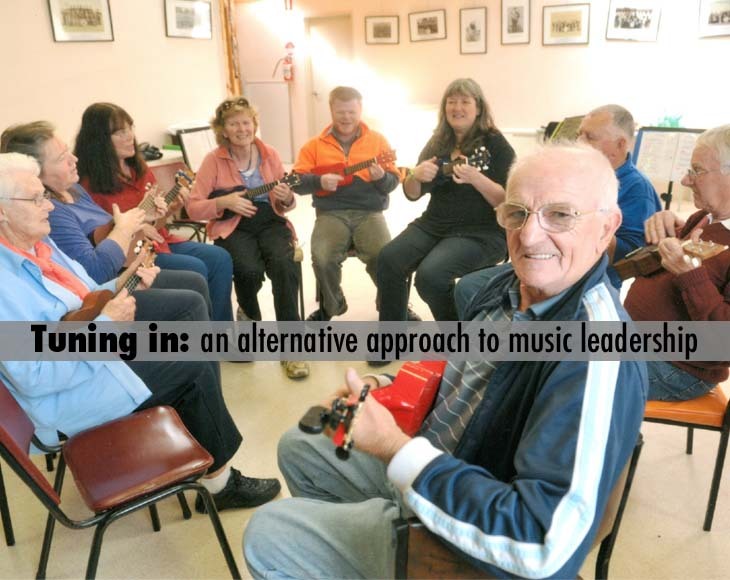 Music In Communities Network (Music Council of Australia). McCaughey, Claire. (2005). Comparisons of Arts Funding in Selected Countries: Preliminary Findings: Canada Council for the Arts. Reimers, Astrid. (2012). Laienmusizieren: Deutsches Musikinformationszentrum. Small, Christopher. (1998). Musicking: The meanings of performing and listening. Hanover: University Press of New England. Higgins, Lee. (2012). Community Music: In Theory and In Practice: Oxford University Press. Bartleet, Bridie-Lee, Dunbar-Hall, P., Letts, R., & Schippers, H. (2009). Sound links: Community music in Australia. Brisbane: Griffith University. Brusniak, Friedhelm. (Ed.). (2003). Chor – Visionen in Musik. Essener Thesen zum Chorsingen im 21. Jahrhundert. Arbeitsgemeinschaft Deutscher Chorverbänder. [ii] An important note that Germans pay an extra income tax to the church according to the denomination into which they were baptised. The Federal Government collects these taxes to fund church activities. Do you love the freedom and innovation of improvised music making? Our Community Sounds is an exciting and experimental project exploring ‘collective improvisation, the nature of community, and of how these might intersect’. The sessions are free and open to anyone, irrespective of their musical experience or ability, and there will be no leaders. Organisers Paddy Gordon and Conor O’Hanlon are keen to emphasise that they are as much a part of the experiment as the other participants. As long standing friends and musical collaborators, Paddy and Conor have taken different routes, to this point, which is interesting in itself and makes for a strong partnership. While Conor is a self taught musician who has improvised with folk and street musicians from around the world, Paddy had a more traditional grounding, having played the piano from a young age. Both are keen to experiment with boundaries, and each has a love for the connection and community forged through making music with others. 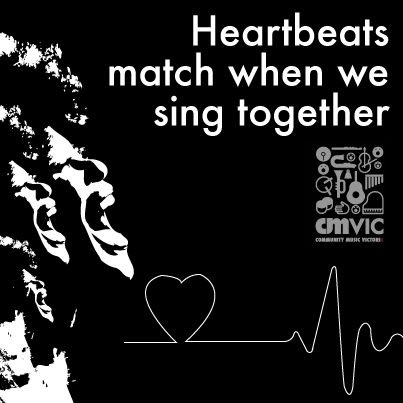 The vision for Our Community Sounds grew from a combination of shared ideas explored in other community music contexts and settings, such as CMVic’s StreetSounds project, and The Welcome Group’s Share the Music jams. Our Community Sounds shaped up as an extension of this question; a social experiment exploring fluidity and connection. A place for people to unite and create a mix of soundscapes as unique and individual as they are, irrespective of their backgrounds or ability, and to experience a shared transience. There are no barriers to participation: “the only prerequisite is a commitment to experimentation, curiosity and open-mindedness”. So how do Paddy and Gordon intend to do this? We guide each group through various exercises that open ears, bodies and minds, moving gradually into collective improvisation. In these experimental community events, we are all equal stakeholders. This approach also functions as a model for engaged and empowered communities. What makes this project so exciting is that by its very nature, improvisation is totally inclusive. There are no rules, it’s impossible to make mistakes or to feel foolish, you can’t hit a bum note and anything goes. The sound, the environment, is fluid and it is transient. In this completely safe space, anything can happen. Barriers dissolve, words become secondary tools of communication and deep connections are established. “In a group improv, there’s a real sense of profundity for everyone involved. You’re all sharing in the creation of something together and from that comes a realisation, an awareness that as the group, you’re creating something even bigger and that you’re all a part of that bigger thing that’s happening… “. In this moment hierarchies are dismantled, and every participant is empowered as a leader. Inclusivity means that we are all equally responsible for the collective – improvisation enables exactly this. It’s an experience which life doesn’t offer us the opportunity to indulge in everyday, and because of this, it has the capacity to be liberating, mentally stimulating and soothing in equal parts, and Paddy and Conor are optimistic that improvising in a group will challenge its participants in positive ways, such as wanting to play new instruments, and to explore and extend artistic practice and methods of expression and sociological connection. As facilitators, we ground our process in deep listening – silence also knows no hierarchies, and really listening to each other is one of the most fundamental ways that we can understand and connect. Improvisation may not save the world, but it teaches us profound lessons about the many different ways there are of being in it..
Paddy is hopeful that people will feel empowered, full of agency, of communion, community and connectedness by their participation in Our Community Sounds. The uniqueness that each person brings to a group and how new concepts and ways of thinking might emerge following three months of shared improvisation, is exciting, and the sounds made by the group will reflect this. Beginning at noon on February 13, the project will run over several sessions until late May, at Testing Grounds on the banks of the Yarra in Melbourne. Paddy and Conor are grateful to Testing Grounds for giving them the physical space needed to carry out the project, and to Museum Victoria for the opportunity to incorporate the beautiful sound of the Federation Bells in Birrarung Marr. Session dates for Our Community Sounds: Feb 13, March 20, April 17, April 30 and May 14. Starting at noon. Going the distance: Taking music on the road to schools in remote regions. The benefits of music in childhood are multiple, impacting and well documented. Yet in spite of proven positive connections between music and early learning, and music and emotional development, mainstream education too often seems to view it as a peripheral extra, a luxury that can easily be dispensed of, and budget cuts in schools seem to hit music departments especially hard. So it’s particularly great to read heart warming stories such as the one about Dennis Winbanks, from North Western Victoria, who travels over 550 kilometres each week to deliver music and music making opportunities to remote and geographically isolated students at schools in regional and rural Victoria. The story, ‘Travelling music teacher going the distance for regional students’ by Sophie Malcolm, was featured on the ABC news website on Wednesday, and is a celebration of Dennis’s recognition of the value and importance of music and his desire to ensure kids living in these remote areas are exposed to the same kind of opportunities enjoyed by their peers living in the state’s larger towns. Dennis teaches about 350 students in four different schools, arriving in a ute and towing a trailer full of instruments. It’s no wonder there’s a strong attendance on the days Dennis rolls up, with his musical cargo in tow. As if its contents and the accompanying diversion from the usual school timetable weren’t magical enough, what Dennis delivers has the potential to transcend all that. He brings not only the opportunity for these children to experience music in a way they may not get anywhere else in their lives, but the subsequent potential for personal enrichment and the development of new pathways: neurological, emotional, educational and creative. Go Dennis! Go music teachers, music group leaders and facilitators, everywhere! Read the full article from the ABC, here. Deb Carveth. Online editor for Community Music Victoria. Moving to Malaysia to live was an adventure for me. A chance to step out of the comfort zone and explore new ideas. Dust off the cobwebs. Little did we know that this was the beginning of a ten year incredible journey living overseas. First, to Malaysia for four years, then India for two, and then Holland for another four. I could write a book. About so many life changing events that have passed and become a chapter of my story. But with all the positives of becoming an expat, I felt a new sense of loneliness and a new thirst to connect to community. An experience that has connected me to millions of people who also feel lonely, isolated or excluded for so many reasons. Little did I realize that my passion for singing and music would provide the solution to my isolation and opened the cultural door far wider than I ever imagined. Singing led me to find a place where I belonged. It’s easy to see the possibilities that singing and music holds for creating an inclusive culture for others who suffer this epidemic of society. I was pregnant with our first child and enthusiastic to dive into our new cultural experience. I was restricted from working due to visa requirements. Although this put my midwifery career on hold I figured that our Malaysian experience would far outweigh the temporary sacrifice. And besides, the thought of living as an expat sounded quite glamorous and exciting. What I learnt abruptly was that aside from all of the amazing life journey experiences, living in another country can be very challenging. What I hadn’t considered was the loneliness of starting from scratch socially. I was no longer working and was away from the support safety net of friends and family before the luxury of internet communication. My sounds of everyday busy social connection were replaced with the echoing hum of quietness. Aside from the loneliness and isolation, there are the language, social and cultural challenges of adapting to a new life. Where do I buy a ladder? What is the name of plain flour in Dutch? How do I find a plumber? Where is the local GP? All the things that you take for granted in your own environment. But of all the challenges in living overseas, isolation was the greatest poverty for me. I was powered into action by listening to my intuitive need to make strong local community connections within the Malaysian culture. I really wanted to experience and be part of Malaysia without the expat goggles. And the best solution: Join a local choir. So I set out and found a local choir by asking around. I had to audition, which was a little daunting but after surviving that process, found a place where I felt included. I had a ball. There were about 45 people and we sang anything from musicals to classical. I felt connected through our harmony. Although I gradually got to know people in the choir better over time, I felt that sense of belonging from the first night. The nagging sense of loneliness stopped tapping me on the shoulder and I decided then and there that I would always belong to a singing group of some description wherever in the world I was. 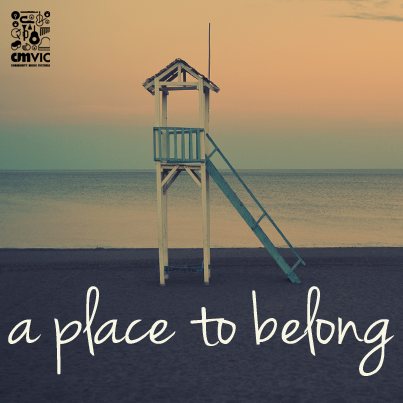 A song always helps us belong. Singing and music was, and always will continue to be, a great way to meet people and help to develop a deeper connection between us all. Sayonara isolation and loneliness. Depending how you look at life, Community Music Victoria is winding down/gearing up for the holidays. The serviettes and paper plates have been counted out, the glasses are on ice and the end of year party happens this weekend. And what a year it has been! Now if you’re waiting for us to share some great turkey cooking tips or table setting layout ideas, you’re going to be sorely disappointed. Neither can we advise you on how to gift-wrap like a pro. This time of year has a tendency to get a little crazy, as we all know. It’s easy to over indulge and what starts out as fun can impact negatively on our mental and physical health and well-being, so we instead we’re focusing on ways to avoid seasonal burn out using, you guessed it, a spot of community music making. Instead of knocking yourself out shopping and cooking, how about pausing to draw breath? Try a spot of mindfulness and reflect on all the positives that have presented over the past year. Invite a group of relatives, friends or neighbours over to sing some songs and make some music together. Add food into the equation and both your body and soul will be nurtured. December 21st is the summer solstice when the sun reaches its highest point in its journey across the Australian sky and is the perfect time to sing and play late into the lightest night. The effects of music making will have a calming effect as you release endorphins and feel genuinely connected with those around you as your heartbeats align through the act of singing together. And that’s not all! Your immunity will be boosted too. A study at the University of Frankfurt in 2004 found that the concentration of a protein called Immunoglobin A was found to significantly increase in singers during a 60 minute rehearsal of Mozart’s Requiem. This stuff is an antibody that works to fight off the multiplication of microbes in the body. Levels of hydrocortisone, an anti stress hormone, was also found to have increased in the singers during the course of the same study. Sounds like the perfect come down to a day spent schlepping around the shops in search of a pink-python printed collar for the cat’s stocking. And it won’t leave you with a headache. Before we release you back into the wilds of December, if you’re reading this, then you’re one of the many people who have signed up to our new blog and we thank each and every one of you for joining us on this journey and for the comments and feedback over the past few months. It feels great to engage with you all. Dina Theodoropoulos was key in getting this blog up and running and at the end of the year she moves on from her current post as Communications Coordinator for Community Music Victoria. We owe her masses for the fantastic work she has done in presenting our outward face to the world so darned well. Finally, don’t forget, we welcome material about your experiences as community music makers and activists and would love to hear about your own musical traditions for marking this time of year. Wishing you all peace and joy for the holidays and good things for 2015. So community singing has reached space with news a week ago about the song emitting from Comet 67P/Churyumov-Gerasimenko. Comet 67P has been chased through space for the past ten years by the Rosetta spacecraft in a bid by scientists to better understand the origin of the world and maybe even ‘the origin of life itself’1 and scientists charting the voyage have now reported that this amalgamation of frozen leftovers from the formation of the planets and the sun, is singing. Social media has been caught up in the romantic notion of this comet calling out to Rosetta across the stars, the moons and all of the cosmos, as it hurtles towards the sun. 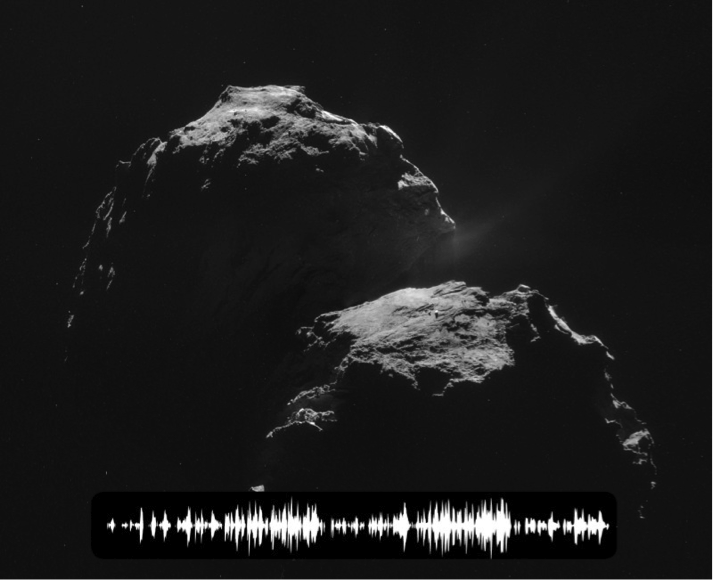 Articles and speculation about the strange sounds have been trending and a recording of Rosetta’s song on soundcloud has been played more than 1.8 million times at the time of writing. But what is going on? Has Comet 67P had enough of being brushed off as a ‘dirty snowball’* and decided to share with the world what comets do to entertain themselves as they traverse the universe? Selecting what to sing along to is a vital component of any road trip, after all. Is it the kooky song of an ancient but optimistic gas ball looking to hook up and discuss space matter(s)? Nope, as with the creation of all sound, what it boils down to, is science, baby. Science and maths. All sound created and emitted in the course of our music making is formed through vibration, oscillation and sound waves and is all a part of the music of the cosmos because “matter is a wave structure of Space and all matter vibrates and has a resonant frequency.” The pitch of the note is dictated by the frequency of the vibration. Got that?! 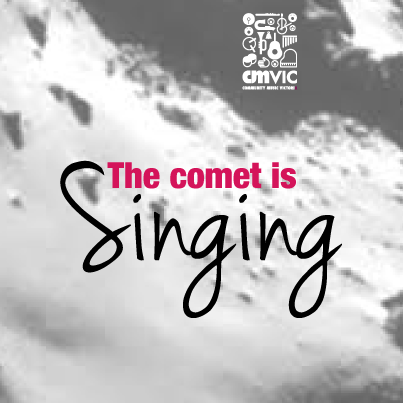 For most of us though, intrigue in the singing comet most likely stems from a desire to indulge the romantic side of our souls and abandon scientific theory in contemplating the notion of singing in space. We look to the skies and the stars to feel release and to escape, for a moment, the constraints of being earthbound. How nice it would be and what a comfort to think that somewhere out there, somewhere cold and foreign and impossibly distant, there is something as reassuring and familiar as song. *just for the record, if there isn’t already a cocktail out there called ‘a dirty snowball, there darned well should be!